Our adorable personalized little animal blankies are sure to become baby's favorite friend. They are super soft and delightfully cuddly, and they are made with pride in the U.S.A.
Each cute plush blanket unfolds to 30 by 36 inches. 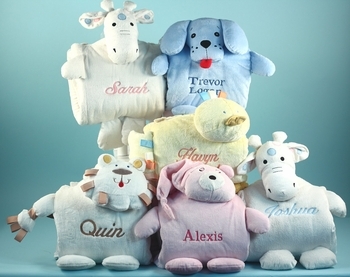 Choose from the adorable pink bear, blue puppy, yellow duck, cream lion, pink poodle, or cream colored giraffe design. Delivered fully gift wrapped ready to impress, these make a wonderful choice for any baby!